Previously known as 'Centre for Environmental Law' started its working in 2011. In 2015, it has been renamed as Centre for Law under the School of Legal Studies and Governance was established with an objective to impart qualitiative legal education offering specialization in Environmental Law, Human Rights and Corporate Law to keep pace with needs of society. Working on a Research Project funded by UGC on entitled “Impact of Laws and Policies to prevent and regulate Pollution form Agriculture Residue Burning: A study of Bathinda District in Punjab”. Working on a Research Project funded by Central University of Punjab, Bathinda on entitled “Impact of Laws and Policies to prevent and regulate Pollution form Paddy Residue Burning: A study of sub division Talwandi Sabo of District Bathinda in the state of Punjab”. Dr. Tarun Arora delivered a lecture on ‘Water Pollution and Law’ at one Week Workshop on Water Harvesting, Water Recycling and Water Resource Management organized at Maharaja Ranjit Singh State Technical University, Bathinda on July 21, 2015. Dr. Tarun Arora delivered a lecture on ‘Judicial Approach on Water Pollution’ at one Week Workshop on Water Harvesting, Water Recycling and Water Resource Management organized at Maharaja Ranjit Singh State Technical University, Bathinda on July 23, 2015. Dr. Tarun Arora, Associate Professor presided over the 3rd M.L. Pagaria Memorial National Moot Court Competition organized by MATS Law School, MATS University, Raipur (C.G.) on Sepetember 20-21, 2015. Dr. Tarun Arora, Associate Professor presided over the 1st National Moot Court Competition organized by N.M. P.G. Law College, Hanumangarh, Rajasthan on November 7-8, 2015. Dr. Tarun Arora, CoC and Associate Professor attended an Orientation Programme of 13th National Youth Parliament organized by Ministry of Parliamentary Affairs and also appointed as Group Cooordiantor for the year, 2016. Dr. Tarun Arora, Associate Professor delivered Keynote Address in International Conference on 'Human Rights in India: A Multifaced Aspect' organized at DAV College, Abohar on 27-28 February, 2016. Dr. Tarun Arora, Associate Professor presented a lead paper on Emerging Paradigms of Jurisprudence with Special Reference to Animal Welfare in National Conference on New Horizons of Veterinary and Forensic Medicine organized by Rajasthan University of Veterinary and Animal Sciences, Bikaner on March 5-6, 2016. Dr. Tarun Arora delivered lecture as a Resource Person in One Day Training Programme on Human Rights organized by Centre for Law, Central University of Punjab, Bathinda in collaboration with NHRC, New Delhi on ‘Rights of Vulnerable Groups: Women and Children in India’ on December 20, 2015. Dr. Tarun Arora delivered a lecture as a Resource Person in Two Day Training Programme on Awareness Programme organized by Centre for Law, Central University of Punjab, Bathinda in collaboration with NCW, New Delhi on ‘Women under Family Law’ on March 9, 2016. Dr. Tarun Arora delivered a lecture on ‘Emerging Trends in Indian Legal System’ to Students of Department of Law in Central University of Kashmir on March 28, 2016. Dr. Tarun Arora provided consultancy in various Training Programmes organized at the Regional Centre of Mahatma Gandhi State Institute of Public Adminsitration on Good Governance, Human Rights, RTI, Citizen Charter, Grievance Redressal Mechanism and 2nd Administrative Reforms Commision. Dr. H.R. Arora, delivered a lecture as resource person on “Translating Social Science (Law) Texts”, 5-day Translator’s Orientation Programme for Knowledge Text Translation (Punjabi), National Translation Mission (NTM) and PURCB. August 13-19, 2013. Dr. Deepak Kumar, Chaired a Technical Session in National Seminar on Urbanization and Environmental Change in India- Problems and Challenges at Department of Geography, Meerut College, Meerut. March 29-30, 2014. Dr. Deepak Kuma presided over Final Round of 1st National Moot Court Competition organized by N.M. P.G. Law College, Hanumangarh, Rajasthan on November 7-8, 2015. 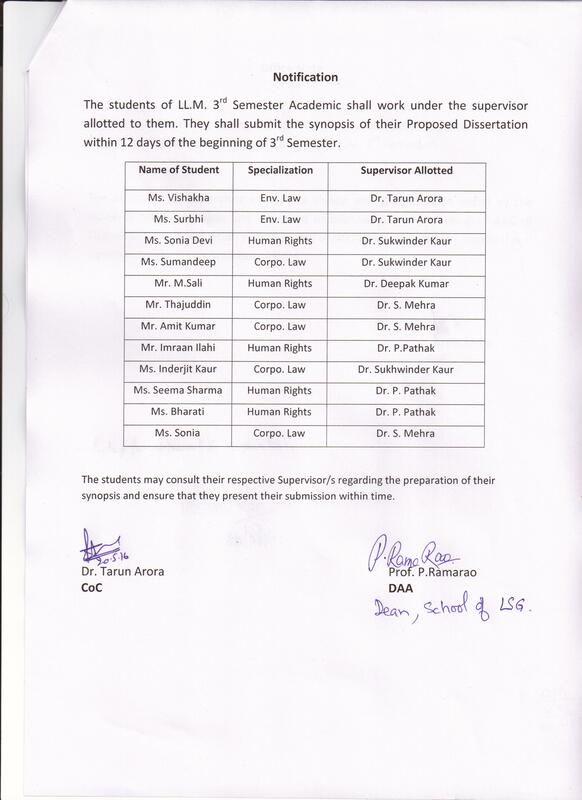 Dr. Puneet Pathak was invited as resource person on “Social Justice under Indian Constitution”, National Workshop on Human Rights and Social Justice at Department of Law, S. K. Saket P. G. College, Faizabad. December 07, 2013. Dr. Puneet Pathak was invited as resource person on “Human Rights and Duties" and "Law to protection women against Sexual Harassment at Guru Nanak Dev College, Sri Mukatsar Sahib, January, 2016. Dr. Puneet Pathak delivered a lecture on 'Social Justice under Indian Constitution”, National Workshop on Human Rights and Social Justice at Department of Law, S. K. Saket P. G. College, Faizabad. December 07, 2013. Last modified: February 14 2019 08:41:48.